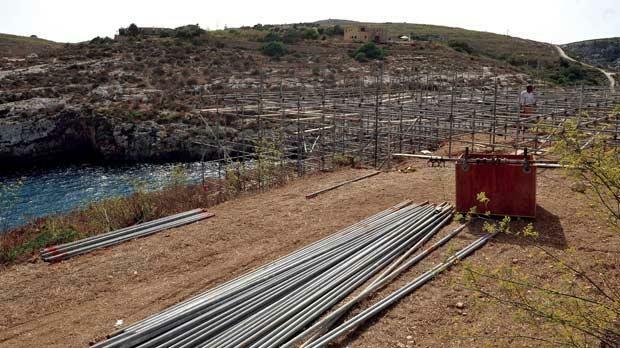 Scaffolding goes up at the picturesque Mġarr ix-Xini bay in Gozo in preparation for filming. Mġarr ix-Xini bay will be closed between the end of August and mid-October as Angelina Jolie and Brad Pitt use the location for their next film, Times of Malta has learnt. The picturesque location, a Natura 2000 site – an area of high ecological importance – will serve as a backdrop for the film scripted by Ms Jolie, which will feature her husband. Sources said public access to the area would not be allowed as filming took place on the hillside in the vicinity of the pumping station and on the beach. They said a tent erected on the hill would serve as a site office and carpentry work was in progress yesterday. 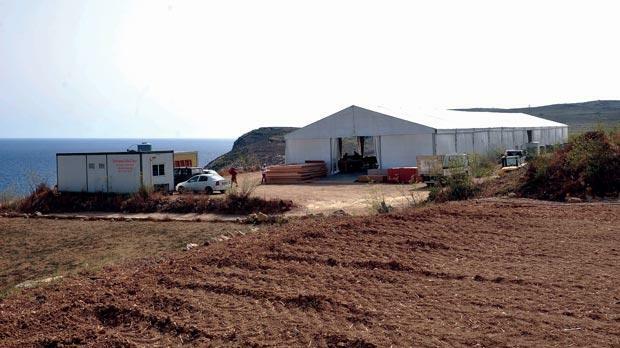 Set construction has already started in arable fields along the hill after the production obtained a permit from the Malta Environment and Planning Authority. The sources said the set on the beach would serve as “facade dressing”, which in the film industry means a way of screening the concrete platform and eatery in the area. A condition included in the permit ensures that environment officials are permanently on site in order to monitor developments. Mepa wanted to ensure there was no repeat of the environmental disaster that occurred four years ago in Dwejra when construction sand was dumped onto the rocks during the filming of Game of Thrones, the sources added. When contacted, Sannat mayor Philip Vella said the council was holding talks with the producers and being consulted on every step. “We have no details yet on when the area will be closed and to what extent it will be inaccessible to the public but this is a positive development for Gozo and our locality,” he said. Asked about the environmental sensitivity of the site, Mr Vella said the council insisted that Mepa monitors should be present at all times to ensure things were done correctly. Although no details of the film have emerged yet, industry sources expect the almost two-month long filming spree to leave about €10 million in the economy. People from the production team have been in Malta for almost a month now working on preparations for the filming. The Hollywood couple had made a scouting trip to Gozo last month during which they set their eyes on Mġarr ix-Xini. This will be the first time since Mr and Mrs Smith, when Ms Jolie and Mr Pitt starred together, that they will work on the same film again. They have six children and, prior to last month, were here in 2011 when Mr Pitt was filming the zombie film World War Z.
Ms Jolie, a UN goodwill ambassador for refugees, was last month made an honorary dame in the Queen’s birthday honours, one of the highest accolades granted by the British establishment. She was recognised for her work on sexual crimes during conflict.